Alexander Bain (June 11, 1818 – September 18, 1903) was a Scottish philosopher, logician and educationalist who advanced the study of psychology with his work on mental processes. Bain was a utilitarian and a major proponent of the British school of empiricism, together with James Mill and his son, John Stuart Mill. He conducted extensive research in the field of psychology, and proposed that all knowledge and all mental processes had to be based on actual physical sensations, and not on spontaneous thoughts and ideas. Bain attempted to identify the link between the mind and the body and to discover the correlations between mental and behavioral phenomena. In The Senses and the Intellect (1855) and its companion volume, Emotions and the Will (1859), Bain proposed that physiological and psychological processes were linked, and that traditional psychology could be explained in terms of this association. For 20 years Bain was professor of logic and English literature at the University of Aberdeen. He applied his knowledge of logic to developing an effective method of teaching, and succeeded in reforming the way in which English grammar and composition was taught in northern Scotland. He produced a number of standard textbooks, including Higher English Grammar (1863), Manual of Rhetoric (1866), in A First English Grammar (1872), and Companion to the Higher Grammar (1874). In 1870 he published Logic, also a work designed for the use of students; it included a section on the classification of the sciences, and gave a detailed application of the principles of logic to the various sciences. In 1876 Bain founded the first psychological journal, entitled Mind. Bain was born in Aberdeen, Scotland, on June 11, 1818. His childhood was difficult; his father, a retired soldier, was a handloom weaver and Alexander had to help in this occupation. While a student at Gilcomston School, he caught the notice of Dr. John Cruickshank, who was surprised by the extent of his knowledge. With the encouragement of Dr. Cruickshank and several local townsmen, Alexander was able to enter Marischal College in 1836, at the age of 18, and studied under Dr. John Cruickshank, professor of mathematics; Thomas Clark, professor of chemistry; and William Knight, professor of natural philosophy. Those around him at the time recounted that he would return home from Marischal College, take off his red academic robe, throw it over a loom and begin weaving, with a book open in front of him. He was later humorously referred to as Weevir, rex philosophorum. Bain distinguished himself in college, especially in psychology, mathematics and physics. Towards the end of his arts course he became a contributor to the Westminster Review (first article "Electrotype and Daguerreotype," September 1840). During this time he wrote a criticism of Sir John Herschell that brought him—through John Robertson, a fellow-Aberdonian, then joint-editor of the London and Westminster Review—into contact with John Stuart Mill, who became his lifelong friend. In 1841 Bain substituted for Dr. Glennie, the professor of moral philosophy, who was unable to discharge his academic duties because of poor health. He did this for three successive terms, during which he continued writing for the Westminster, and also helped Mill with the revision of the manuscript of his System of Logic (1842). In 1843 he contributed the first review of the book to the London and Westminster. In 1845 Bain was appointed professor of mathematics and natural philosophy in the Andersonian University of Glasgow, but resigned a year later, preferring a wider field, and devoted himself to writing. In 1848 he moved to London to fill a post in the Board of Health, under Edwin Chadwick, and became a prominent member of the brilliant circle which included George Grote and John Stuart Mill. In 1855 he published his first major work, The Senses and the Intellect, followed in 1859 by The Emotions and the Will. These treatises won him a position among independent thinkers. He was examiner in logical and moral philosophy (1857-1862 and 1864-1869) to the University of London, and in moral science in the Indian Civil Service examinations. As a young man, Bain’s health was so fragile that his acquaintances doubted whether he would live even a few more years. He overcame these difficulties by adhering to a strict routine of diet, exercise and rest, which he maintained even when traveling abroad or visiting friends. The regularity and simplicity of his habits conditioned his entire life. 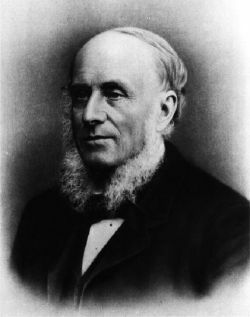 In 1860 he was appointed by the crown to the new chair of logic and English literature at the University of Aberdeen (created by the amalgamation of the two colleges, King's and Marischal, by the Scottish Universities Commission of 1858). Up to this date neither logic nor English had received adequate attention in Aberdeen, and Bain devoted himself to supplying these deficiencies. He succeeded not only in raising the standard of education generally in the north of Scotland, but also in forming a school of philosophy and in widely influencing the teaching of English grammar and composition. His efforts were first directed to the preparation of textbooks; Higher English Grammar (1863), followed in 1866 by the Manual of Rhetoric, in 1872 by A First English Grammar, and in 1874 by the Companion to the Higher Grammar. These works were wide-ranging and their original views and methods met with general acceptance. Bain’s own published philosophical writings, especially The Senses and the Intellect (to which was added, in 1861, The Study of Character, including an Estimate of Phrenology), were too large for effective use in the classroom. In 1868, he published a condensed form of his treatises, Manual of Mental and Moral Science, with the doctrines re-stated, and in many instances freshly illustrated, and with many important additions. In 1870 he published Logic, also a work designed for the use of students; it was based on Mill, but differed from him in many particulars. His services to education in Scotland were recognized by the conferment of the honorary degree of doctor of laws by the University of Edinburgh in 1871. Next came two publications in the "International Scientific Series," Mind and Body (1872), and Education as a Science (1879). During his 20 years as a professor at Aberdeen, Bain also started the philosophical journal, Mind; the first number appeared in January 1876, under the editorship of a former pupil, George Croom Robertson, of University College, London. Bain contributed many important articles and discussions to this journal, and bore the whole expenses of it until Robertson, owing to ill-health, resigned the editorship in 1891. Bain retired and was succeeded by William Minto, one of his most brilliant pupils. His interest in thought and his desire to complete the scheme of work mapped out in earlier years, remained as keen as ever. In 1882 the Biography of James Mill appeared, accompanied by John Stuart Mill: A Criticism, with Personal Recollections. Next (1884) came a collection of articles and papers, most of which had appeared in magazines, under the title of Practical Essays. This was succeeded (1887, 1888) by a new edition of the Rhetoric, and along with it, a book On Teaching English, an exhaustive application of the principles of rhetoric to the criticism of style, for the use of teachers; and in 1894 he published a revised edition of The Senses and the Intellect, which contain his last word on psychology. He also wrote his last contribution to Mind in 1894. His last years were spent in privacy at Aberdeen, where he died on September 18, 1903. He married twice but had no children. Bain took a keen interest and frequently an active part in the political and social movements of the day; after his retirement from the chair of logic, he was twice elected lord rector of the university, each term of office extending over three years. He was a strenuous advocate of reform, especially in the teaching of sciences, and supported the claims of modern languages to a place in the curriculum. A marble bust of him stands in the public library and his portrait hangs in the Marischal College. Although his influence as a logician, a grammarian and a writer on rhetoric was considerable, Alexander Bain’s reputation rests on his development of scientific psychology. In complete agreement with Johannes Müller in the conviction psychologus nemo nisi physiologus, he was the first in Great Britain during the nineteenth century to apply physiology in a thoroughgoing fashion to the elucidation of mental states. He was the originator of the theory of psycho-physical parallelism, which is used widely today in the work of modern psychologists. His idea of classifying psychical phenomena in the same manner as natural history gave scientific character to his work, the value of which was enhanced by his methodical exposition and his command of illustration. Bain insisted that psychology should be cleared of metaphysics; and was influential in establishing psychology as a distinct positive science. Bain was a utilitarian and a major proponent of the British school of empiricism, together with James Mill and his son, John Stuart Mill. He proposed that all knowledge and all mental processes had to be based on actual physical sensations, and not on spontaneous thoughts and ideas. Bain attempted to identify the link between the mind and the body and to discover the correlations between mental and behavioral phenomena. In The Senses and the Intellect (1855) and its companion volume, Emotions and the Will (1859), Bain proposed that physiological and psychological processes were linked, and that traditional psychology could be explained in terms of this association. These works remained standard texts for British students until the end of the nineteenth century; The Senses included an important chapter on the nervous system. William James called Bain’s work the "last word" of the earlier stage of psychology, but he was in reality the pioneer of the new. Although Bain consistently advocated the introspective method in psychological investigation, he was among the first to appreciate the insight that could be gained from animal, social and infant psychology. He emphasized the importance of our active experiences of movement and effort, and though his theory of a central innervation sense is no longer held, it was valuable as a suggestion to later psychologists. His autobiography, published in 1904, contains a full list of his works, and also the history of the last thirteen years of his life by W. L. Davidson of Aberdeen University, who further contributed to Mind (April 1904) a review of Bain's services to philosophy. As a logician, Bain followed J. S. Mill, with many reservations. He was concerned with the application of logic to all fields of study, including education. In Logic he introduced a section on the classification of the sciences, and gave a detailed application of the principles of logic to the various sciences. His wide scientific interests led him to view the conservation of energy in connection with causation. Works (beside the above): Edition with notes of William Paley's Moral Philosophy (1852); Education as a Science (1879); Dissertations on leading philosophical topics (1903, mainly reprints of papers in Mind); he collaborated with J. S. Mill and Grote in editing James Mill's Analysis of the Phenomena of the Human Mind (1869), and assisted in editing Grote's Aristotle and Minor Works; he also wrote a memoir prefixed to G. Croom Robertson's Philosophical Remains (1894). Mill, James. Analysis of the phenomena of the human mind with notes illustrative and critical by Alexander Bain, Andrew Findlater and George Grote. Edited with additional notes by John Stuart Mill. Longmans, Green Reader, and Dyer, 1878. Davidson, William L. "Professor Bain." Obituary from Mind (Jan. 1904). This page was last modified on 2 March 2016, at 17:24.